Whilst taking an evening stroll on the evening of 11thJuly 2013, I noticed a small pale green light emanating from the grass beneath a Sweet Chestnut tree in Droitwich Community Woods. On further inspection, I realised that the source of the light was a female Glow-worm Lampyris noctiluca – something I had not seen in the area for over 20 years (last seen near Porters Mill c. 1989). Repeated visits to this and nearby sites over the next month revealed several more glowing females and the presence of at least two small but potentially locally-important colonies of this species. 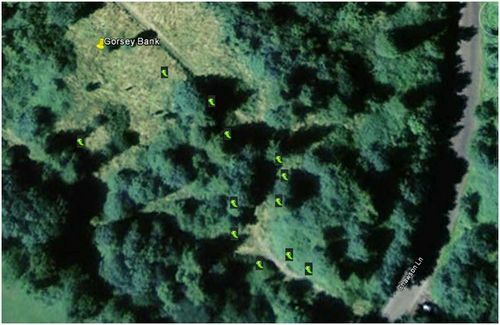 This brief report is an attempt to provide some information as to the size and distribution of the colony at Droitwich Community Woods as well as drawing attention to another relict colony at Harford Hill near Ladywood. It is hoped that this information will help to ensure, where possible, that future management is geared towards their continued survival at these sites. 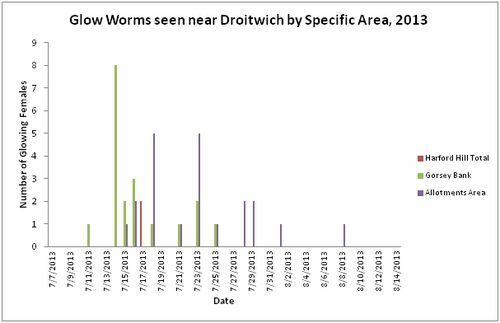 Between 11 July 2013 and 08 August 2013, a total of twelve visits were made to Droitwich Community Woods. Every evening visit between these dates returned positive sightings. The highest daily total of eight glowing females was on the 14th July, followed by five on the 16th July, six on the 18th July and seven on the 23rd July. Between one and three were seen on all other dates. 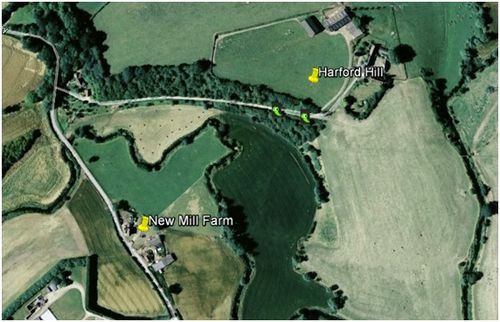 Harford Hill, near Ladywood, was only visited on one occasion (17th July) when two glowing females were seen along the grass verges of a farm-access track. In order to illustrate the distribution of sightings, I have plotted the positions of observed Glow-worms on the following Google Earth maps. The above (07) is based on the position of each glowing female and the date that it was seen. Obviously, if an individual was seen in the same area (or within a couple of yards) on subsequent evenings, then it is only counted as one female. In actuality, several individual females were seen in exactly the same place over successive evenings and didn’t appear to change their ‘glowing position’ greatly. To my knowledge, the presence of the Glow-worms was only ‘discovered’ in this area on 11th July this year. No data for June or earlier in July (when Glow-worms can also be active) is, therefore, available. It is, however, assumed that peak activity probably occurs in July. 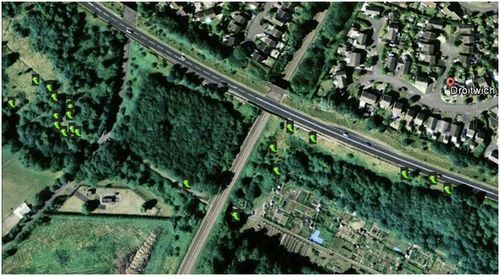 Not all areas were surveyed on all evenings, especially the areas between the Roman Way and Chawson Lane Allotments, where chance discoveries prompted more methodical searching on later dates. 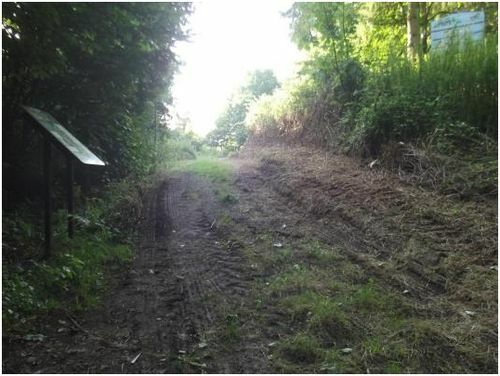 Some apparently suitable habitat, such as along the railway line, was not surveyed at all (due to access restrictions). The grassland along the railway could, indeed, provide the main Glow-worm habitat and the ones observed in the Community Woods are merely ‘overspill’ from this ‘reservoir’. It is interesting to note how the distribution is clustered either side of the railway track. Railway embankments could provide corridors of suitable habitat, allowing Glow-worms to colonise new areas. Open areas of long grass containing herbaceous vegetation, such as Yarrow, Wild Carrot, Meadow Vetchling, Knapweed and Ragwort (7+). In grass under the canopy of trees such as Ash, Sweet Chestnut, Larch and Cherry (5). In Bramble / scrub patches (3). Areas of shorter grass with bare patches and flowering plants such as Lady’s Bedstraw, Birdsfoot Trefoil and Musk Mallow (2). Note: The grasslands of Gorsey Bank, especially, are grazed in patches by Rabbits. Muntjac Deer are also seen regularly in the area. On short grass verge along busy main road (1) and on verge along quieter access lane (2). In short-cropped, recently mown grassy areas (0). For the future conservation of Glow-worms at this site, management regimes should probably aim to maintain the mosaic of these habitats, in order of apparent importance. 09 The Harford Hill colony is 1.5km due west of the colony at Droitwich Community Woods. The two colonies are likely to be isolated from each other as and they are separated by the Droitwich Canal and the River Salwarpe (as well as intensively-cultivated farmland) and the female Glow-worms are unable to fly. The central location (within Worcestershire) of the Glow-worm colony in Droitwich Community Woods and its proximity to the inhabitants of both Droitwich Spa and Worcester city would seem to offer an ideal opportunity for similar public events in future years, assuming that the population thrives and that future management of the site encourages their survival. “A decline is evident over the entire range of L. noctiluca in Britain. This decline is not restricted to one particular habitat type. A fall in numbers has been observed equally in grassland, fenland, woodland and coastal sand dune habitats. Little empirical data is available as to the actual causes of glow-worm population decline in Britain. A number of theories have been present and one which has been to be investigated is the impact of light pollution. However, much more work needs to be conducted in order to appraise the situation fully. Habitat destruction is similarly talked about as a potential cause of population decline. Alexander (1992) emphasises that the main objective of management for L. noctiluca should be to maintain vegetation structure and snail populations. Wherever possible, the available L. noctiluca habitat should be extended in an effort to link it to other favourable areas. Patches of scrub and dead wood should be retained within open grassland areas to provide cover for larvae and snails (Alexander 1992). In some reserves wooden boards have been laid out on the ground to provide additional shelter for glow-worm larvae. “We still do not know why some colonies die out even though there are no obvious factors such as destruction of habitat, use of pesticides or herbicides, or strong artificial lighting of the site. Glow-worms need a supply of small snails as food and therefore a patch of vegetation where they can find the snails. They also need a comparatively open area where the females can display to attract a male in June, July and August. As they retire into the ground during the day, high mowing does not appear to affect them unduly and very long grass may actually not be very suitable. However, my feeling (in discussion with a keen observer, Linda Worrall of Barrowden, Rutland) is that the best cutting regime is not to cut at all during the glowing season from the beginning of June till the middle or end of August. If cuts are vital they should be restricted to high cutting, so as not to get down to the insects which will be down in the understorey. 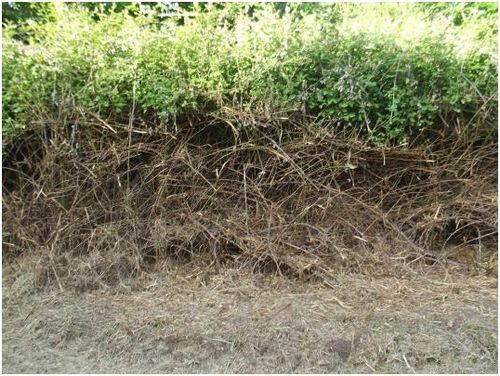 A certain amount of hay lying on the top is preferable to raking it up, which would probably disturb the Glow-worms, but what you have to avoid is cutting in wet weather which will produce a thick mat of clippings that even the most determined Glow-worm will find it difficult to climb through at night. The females may appear on footpaths and there is therefore a danger period during summer if the path is heavily used in the late evening while they are emerging to glow. There is not much that can be done about this other than getting people to walk in single file. " There must be some aspects of the habitat and conditions in the currently occupied parts of Droitwich Community Woods that Glow-worms find to their liking. It is currently unknown how long they have been present at this site or when they colonised the site. It is hoped that future conservation efforts will ensure their continued survival and, hopefully, their spread. However, some concern has been expressed by me and fellow Glow-worm watchers this year over the management that was carried out around the 1st August, 2013. This removed areas of both bramble scrub and mowed the grassland that held glowing female Glow-worms only a few days before. The mowing carried out was very low and caused damage to the underlying ground, exposing areas of bare soil in several places. It is unknown whether or not this has destroyed any adult Glow-worms, eggs or larvae or whether this will have a detrimental impact on their numbers in following years. 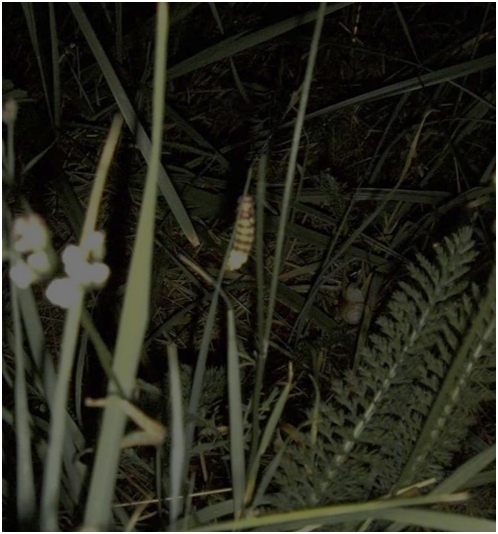 However, it is greatly hoped that the impacts of such management regimes are minimised in future, in accordance with guidelines suggested in the previous section, entitled Glow-worm Conservation. The following photographs show the areas affected by the management that was carried out. 13 & 14 Area of removed bramble scrub opposite reserve interpretation board (Photos : M and T Owens). This area was cleared on 1st August 2013. 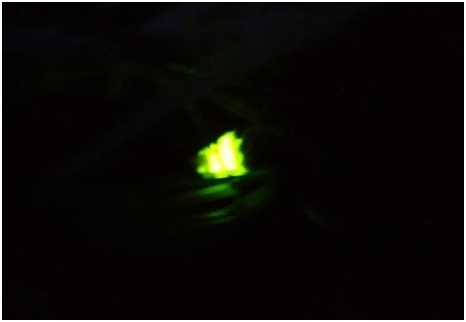 This scrub held glowing female Glow-worms only a few days before. No Glow-worms were seen in this area after the management was carried out. 15 Mown grassland area of Droitwich Community Woods (Photo: M and T Owens). This area held female Glow-worms a few days before the mowing was carried out on 1st August. No Glow-worms were seen in the area after it was mown. 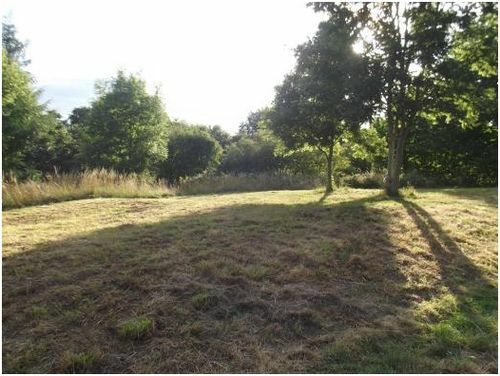 It is probable that delaying mowing of the site until late August or even September would be more beneficial to the Glow-worms present at this site. 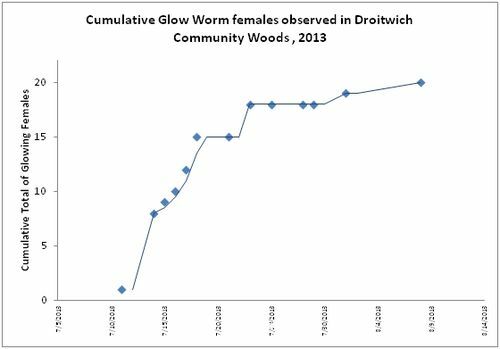 In 2013, Droitwich Community Woods supported a colony of Glow-worms which may be of considerable local significance. Frequent visits to this area during July and August allowed a rudimentary assessment of the size and extent of the colony to be made. It is estimated that a minimum population of 20 females was present at this site. 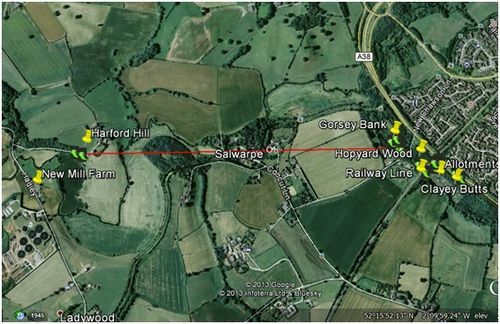 A further extant colony was found to be present near Ladywood at Harford Hill (SO8665661954), although only one visit was made to this site so it is not possible to provide much detail regarding the size or extent of this population. Two females were present here on 17th July, 2013. The data is provided in order to aid the preservation of this species in this area of Worcestershire. Glow-worms are attractive insects, they tend to appeal to the general public and can be used as a ‘showcase’ species in order to further the aims of nature conservation in general. Maintain the current vegetation structure - a mosaic of open grassy areas interspersed with (bramble) scrub and trees. Patches of dead wood and scrub retained to provide cover for larvae and snails. Consider laying out wooden boards in a few places to provide additional shelter for larvae. (Note: A couple of females near the allotments were found adjacent to a discarded wooden pallet). If possible, delay mowing until after the main glowing season has finished (towards the end of August). 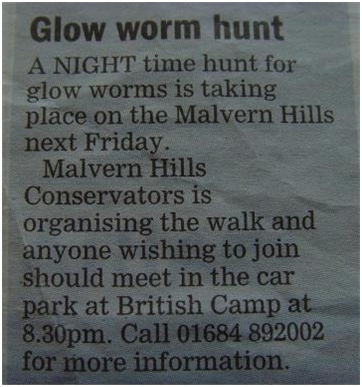 Encourage the spread of Glow-worms to other nearby sites, if possible. Further potentially-suitable grassland exists on the other side of the Droitwich Canal (e.g. Coney Meadow Reserve plus other parts of Droitwich Community Woods). Female Glow-worms have been found on the grass verge of the Roman Way this year and this could provide a literal bridge to these sites if the current population was encouraged to thrive via suitable management of ‘Gorsey Bank’. Where possible, protect these areas from encroachment of artificial lighting. This may be a factor in future if proposed developments go ahead between Chawson Lane allotments and Copcut Lane. Alexander, K N A 1992 The Glow-worm, Lampyris noctiluca (L.), in Gloucestershire and its conservation. The Gloucestershire Naturalist. 5: 1-5. Knight, Terry. 2002. Glow-worms at Windmill Hill reserve, North Littleton 1982-2002. Worcestershire Record 13:32. 02. Bar-chart below gives the daily totals of glowing females on each evening visited. Icon indicates location of individual glowing females. 04. 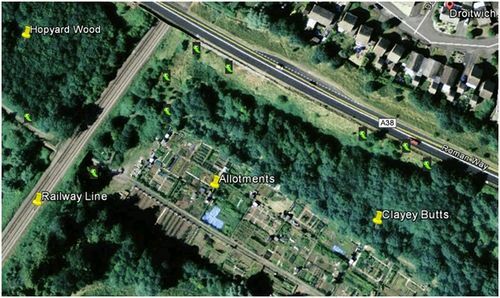 Detailed Distribution of Glow-worm Sightings, Chawson Lane Allotments Area. 05. 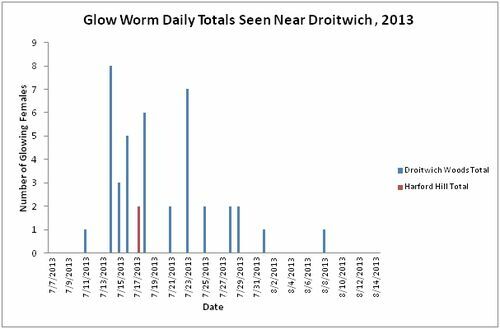 Overall Distribution of Glow-worm sightings in Droitwich Community Woods. 06. Chawson Lane Allotments as the ‘glowing season’ progressed. 07. An assessment of the total number of glowing females. 08. The Harford Hill colony two glowing females were seen. 09. The Harford Hill colony is 1.5km due west of the colony at Droitwich Community Woods. 10. Glow-worm Known Distribution in VC 37. 11. 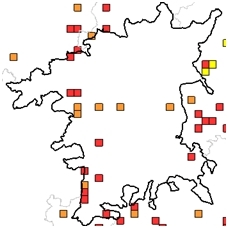 Glow-worm Known Distribution in VC 37. 12. Extract from Worcester News, July 2013. 16. Glowing abdominal segments of a female Glow-worm. D. Walker.